Last week, at the request of the new owner, I had a puppy I bred vaccinated. The puppy went downhill overnight and is now seriously ill. The vet is telling me that this puppy’s condition and the vaccination are coincidences. The puppy is going into kidney failure caused by either leptospirosis (in the vaccine) or drinking anti-freeze (impossible). Can there be a connection between the vaccine and the puppy’s health? I had to put Hamish to sleep on Sunday. He deteriorated rapidly over the weekend and I decided I couldn’t allow him to go through any more. There are a lot of ‘if only we did this’ days. My other half says I’m too hard on myself and perhaps I can be but it’s very hard to put out of my mind what that poor baby had to go through. The pharmaceutical company have said they will pay for an autopsy. I’ve said if you pick up the rest of the £300 bill. They refused so I’m refusing to let them have the autopsy done. I asked why are you so keen on an autopsy when you claim it wasn’t your vaccine? No answer! I stopped vaccinating in 1990 after a similar incident and this was only done at the new owner’s request so NEVER again will a vaccine come near my dogs. Lepto is a very adverse event associated vaccine and the damndest thing is that lepto vaccines simply do not work. Dr Ron Schultz (the world’s foremost independent authority on canine vaccines) hates to see them in with anything else and, in puppies, advises that they are completely finished with the viral inoculations before getting a vaccine against Lepto, which he neither recommends nor advocates – even in Lepto endemic areas. I have seen older dogs go into kidney failure within two days of receiving a Lepto vaccine. FACT: 60% of vets are vaccinating three times more often than the veterinary colleges recommend … and countless others are vaccinating more often than recommended. 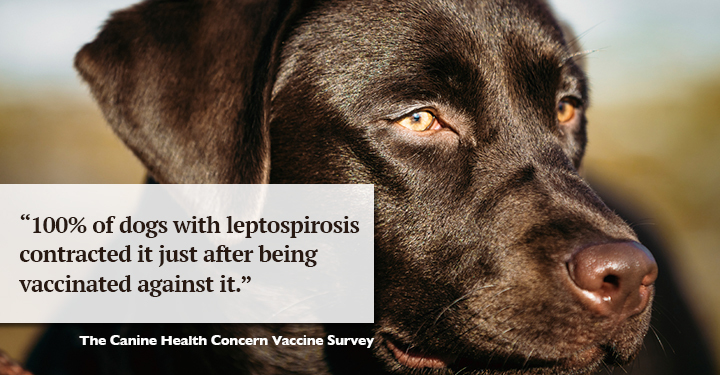 Get our FREE Vaccine Essentials Guide now – it’s critical to the health of your dog!